Humana launches campaign 'Save 140', which have joined 13 municipalities in Catalonia: Begues, Bigues i Riells, Calafell, Cardedeu, Cerdanyola del Valles, El Masnou, Montgat, Reus, Ruby, Senmenat, Tordera, Vallirana and of Carr. The aim of the campaign is to encourage citizens to deposit as many clothes in containers dedicated to the collection of waste textiles. 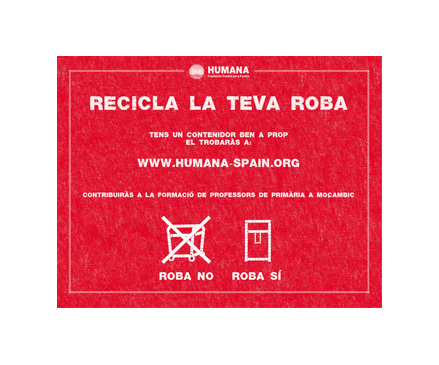 Thus, Humana, in collaboration with the municipalities involved, has begun placing thousands of red stickers on containers of rest. The campaign was also initiated to coincide with the change of season and, therefore, with the time that public update your wardrobe and get rid of those clothes that no longer useful. The goal of humanity is carrying out this campaign in all municipalities that wish to do so. In 2010, only in Catalonia were collected over 5 million kilos of clothing and footwear used in the approximately 1,100 existing containers. 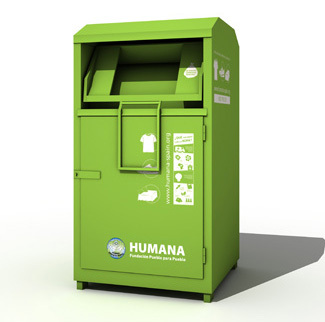 The name of the campaign responds to 140 euros per each municipality saves 1,000 kilos of clothing and footwear used in the containers collected Humana, by recycling waste that would otherwise go to landfill, with the consequent cost that this means for municipal coffers and, therefore, for the citizens.